Over the 19th century the various bloody successions to the Zulu throne would make European medieval royal history seem as harmless as the tale of ‘the three little pigs’. Four of Senzangakhona’s direct sons would ascend the Zulu throne. Three of these ascensions were by the violent and murderous death of their immediate predecessor. Finally, King Mpande’s two sons, through rash and impetuous actions, precipitated the beginning of the end for the Zulu nation. Schemers in the British Cape government in South Africa secretly planned to overthrow and totally subjugate the Zulu. This however was easier said than done. 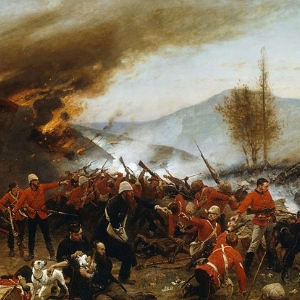 Britain would first taste the bitterness of her greatest ever defeat in battle to that date against the Zulu.